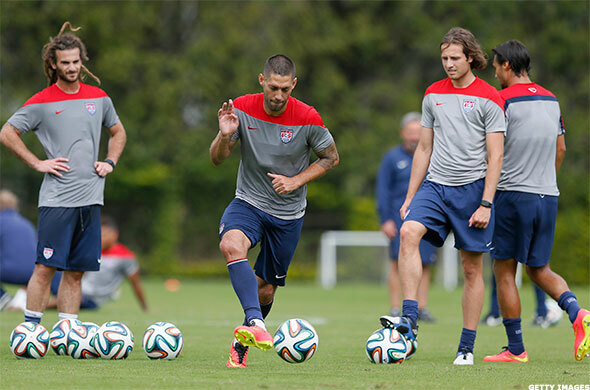 U.S. Soccer is a long-term investment, but its head coach believes the payoff will be big. Corporate sponsors and broadcasters are in. Why aren't you? PORTLAND, Ore. (TheStreet) -- Why should you invest your time in watching the United States struggle through the World Cup? Because far more is being invested just to get this team into the first round. We realize that this isn't exactly an ideal year for soccer novices or lifelong fans to put everything they have behind the U.S. Men's National Team. Its most marketable player, Landon Donovan, couldn't make the cut this year. Its most exciting prospects, including 18-year-old Julian Green, likely won't make a big contribution until 2018. Its competitors in Group G include a nation that has been to the World Cup final seven times and won thrice (Germany, with U.S. coach Jurgen Klinsmann taking home the country's last World Cup hardware as a member of its 1990 team), another with arguably the best player in the world on its roster (Portugal and Cristiano Ronaldo) and a third that has booted the U.S. out of its last two World Cup appearances (Ghana). So who thinks those long odds are worth betting on? Just these folks: Allstate (ALL - Get Report), AT&T (T - Get Report), Anheuser-Busch InBev (BUD, General Motors (GM - Get Report), Clorox (CLX - Get Report), Unilever (UL, Johnson & Johnson (JNJ - Get Report), Marriott (MAR - Get Report), McDonald's (MCD - Get Report), PepsiCo (PEP - Get Report), Mondelez (MDLZ, Nike (NKE, Panasonic (PCRFY) and Visa (V. Those are just the publicly traded sponsors of U.S. Soccer, but they represent billions of dollars of market capitalization supporting not only the men's team and the Women's National Team that takes the pitch in 2015, but the future of soccer in the United States. They've helped fund 79 development academies designed to help a greater portion of this country's more than 3 million youth soccer players excel at the sport and learn the international game beyond the packs of kids chasing the ball and going out for ice cream afterward. They've helped build a developmental system that takes players out of high school and college programs and puts them into structured age brackets that prepare them for a future with partner teams in Major League Soccer, the English Premier League, Italy's Serie A and elsewhere. More importantly, they're attempting to elevate the game to a level where most U.S. sports fans can not only see it, but can identify its biggest talent before it every appears on the national team. It's been receiving a whole lot of help in recent years from not only current Major League Soccer, national team and World Cup broadcasters ESPN, ABC and NBC, but from future broadcasters like Fox Sports. Fox alone has dumped $400 million into securing the English-language broadcast rights to the World Cup in 2018 and 2022, but has also joined ESPN in paying $600 million to broadcast both Major League Soccer and U.S. Men's National Team matches. You don't invest in U.S. soccer for the short-term returns. Fans who jumped aboard after the 1994 U.S.-hosted World Cup and the national team's 1-0 Round of 16 loss to Brazil had to wait until 2002 to witness the next big advance -- when the U.S. made it to the quarterfinals against Germany. MLS fans who jumped on the in the league's early, star-studded days had to endure oversized venues, aging international talent and failing teams for more than a decade before the league shrunk its stadiums, developed talent and built from within. Even now, it's not a perfect system -- but it's much improved. Such is the case with the men's team today. Making the Round of 16 in 2010 after being ushered out in the first round of 2006 seems like progress, but it's temporary. Klinsmann and his assembled group of established veterans including Clint Dempsey, Jozy Altidore and Michael Bradley see the potential. It was only two years ago that they got their first-ever at Estadio Azteca in Mexico City. The same year, the U.S. got its first-ever win against Italy -- in Italy. Klinsmann has said repeatedly that this year's U.S. team cannot win the World Cup. He says it because he knows it to be true, but because his goal in bringing young, internationally seasoned players into the fold such as Green, 20-year-old DeAndre Yedlin and 23-year-olds Aron Johannson and Mix Diskerud is because he wants it to be a possibility -- if not an immediate threat -- in 2018. Consider that for a moment. The U.S. hadn't even qualified for the World Cup in 40 years when it made the cut in 1990. It's only made it out of the group stage three times during that span, losing twice in the Round of 16 and once in the quarterfinals 12 years ago. It has gone winless in the group stage three times since 1990 and last did so just eight years ago. But the last seven years have been far different. It finished runner up to Brazil in the FIFA Confederations Cup in 2009 -- and only by a 3-2 margin -- and defeated Spain a year before its World Cup title run to do so. It's finished no worse than second in every CONCACAF Gold Cup since 2005, and just won last year's installment over Panama. It not only qualified for the World Cup with consecutive impressive performances against Mexico, but defeated Germany 4-3 just to celebrate. In half a decade, it defeated two of the Top 2 teams in the world -- a feat the U.S. hadn't accomplished to that point. By gutting a nearly nonexistent soccer development system and retooling itself to not only develop top-flight talent, but streamline it right into the national team, the U.S. has finally replicated a system used in countless top soccer nations including England, Germany and Spain. It's a huge, positive leap, but the results are going to take time. The U.S. is still only 24 years into its international soccer era. It's growth in that time has been impressive, but the leap from “entertaining distraction” to “perennial global competitor” isn't so easy. In 84 years of World Cup play, only eight nations have won the title. The most recent champion, Spain, hadn't finished higher than fourth place since 1950. England won a title in 1966, but only managed a fourth-place finish in 1990 since then. Unless you're Germany, France or Italy, there are small windows of opportunity for nations to build talent great enough for a deep World Cup run. Klinsmann sees it now, and both sponsors and broadcasters are backing him with dollars. The least you can invest is your time, especially if the payoff is as big as U.S. Soccer believes it will be.